Bureau Architecture Méditerranée designed Algerian parliament building Archi-new - Free Dwg file Blocks Cad autocad architecture. Archi-new 3D Dwg - Free Dwg file Blocks Cad autocad architecture. Bureau Architecture Méditerranée architectural office revealed new designs for the building of the Algerian parliament on the big yard, "which joins the free people"; it is a complex area of 220 thousand square meters featuring Ibana is the People's National Assembly, the National consulate, and the parliament, and the seat of the legislation. Branches western entrance to the yard to the Parliamentary Assembly of the National consulate, which constitute the lowest and the highest offices in the Algerian Parliament to Tkonan together "Srahih gate" at the entrance to the arena. As at the end of the scene from the eastern side there are the parliament building to be located behind leaders this represented for his role in bringing the collection to other offices with each other, in addition to its role in hosting the World delegations reference to "the Algerian usually in the hospitality and providing distinguished place for the guest." 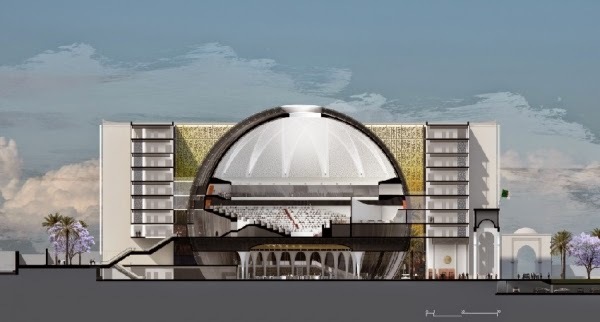 The design of each of the three buildings in a similar way; Taking offices and chambers of the heart of the building where the central dome that symbolizes the sky Algeria. In the parliament building has been making this dome on CCAMLR structural origin covers an open terrace above the parliament itself, located on the central hall offices, meeting rooms, Alabhah required for effective government action. The fact that these rooms are located on the outer sides of the buildings, they benefit from the views of the sights of the city. The facades of the three buildings of glass encased Palmcherbaat ceramic and concrete as an "echo traditional Arab architecture in the city is made up."